Department of Civil Engineering, Chitkara University, Himachal Pradesh, organised a two-day fest “TECHNOVATION 2k18”, to encourage Engineering students to showcase and test their technical, team building and organisational skills, by competing in multiple technical events. Technovation 2k18, the second edition, is the biggest platform for young innovative minds to showcase their technical skills. 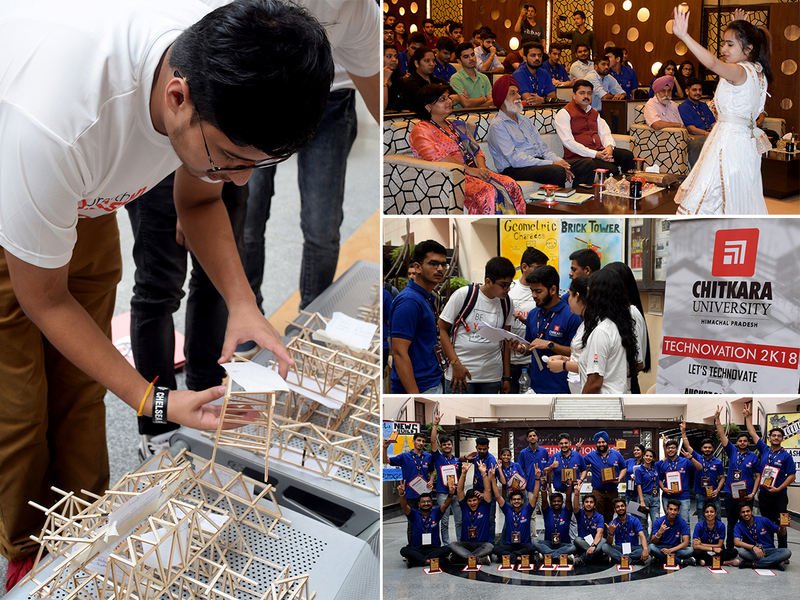 In the two days jam-packed with a plethora of amazing events, around 410 students participated with great enthusiasm. This year’s events included Telegenic, Clash of Wits, Bridge-IT, Cast a Cube, Brick Tower, Survey Hunt, etc. Intermittently, during the events, the team of National Institute of Fire Engineering and Safety Management also visited the campus and demonstrated the importance of Civil Engineers in design and management of fire networks at various places. The fest was inaugurated by Vice-Chancellor, Chitkara University, H.P., Dr. Varinder Kanwar, in the presence of Deans & Heads of all University departments. In the Valedictory ceremony, chief guest Er. G.J.S. Rosha, President, American Society of Civil Engineers-Northern Region, shared his wisdom with the students and honoured the winners with trophies, certificates and cash prizes of Rs 20,000, each. The main sponsors of the event were Ultratech, Innovative Systems, AIMCO and Gate Gurus. We congratulate all the participants and the winners for their technical efforts in making the event successful.